Civil War chronicler Peters (The Damned of Petersburg, 2016, etc.) once again writes of war in Technicolor, this time chronicling the blood-drenched chaos of close combat as Grant's Army of the Potomac forces the surrender of Lee’s Army of Northern Virginia. 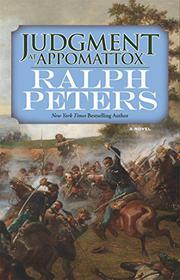 Following the four earlier novels in Peters' series, this volume picks up the war near its end, taking us from March 25 to April 9, 1865, from retreat to surrender, as Peters dissects battles, skirmishes, and routs as Lee abandons Petersburg’s fortifications and is driven relentlessly to subjugation at Appomattox Courthouse. Each clash is distinct, a logical progression arising from Grant having assumed command of the Union Army, the first general to crank his resolve to the sticking place and relentlessly press Lee’s exhausted, starving, ever loyal troops—“these heroes who smelled like mules and fought like archangels.” This endgame is glimpsed mostly from the perspectives of each army’s brigadiers, colonels, and captains—some forever famous, like Joshua Chamberlain, hero of Gettysburg, and boy general George Custer, and others not. It’s the byplay of their skills and incompetencies, resentments and favoritisms that fuels both victory and defeat. Everyone gets his due, from Lincoln, his despair at last driven into shadows by Grant’s victories, to the runty cavalry general “Little Phil” Sheridan, self-aggrandizing at the expense of lesser generals who provided victories. Then there’s Lee himself, physically ill and haunted by the past, and Pickett, failure at Gettysburg, found wanting at Five Forks. The dialogue comes complete with soldierly vulgarities, and descriptions of the maelstroms of open field charges and hand-to-hand combat are so vivid—skulls shattered, guts spilled and trampled—that it seems as if Peters has handed out Springfield 1861 Rifles and pushed us to fill a slot in the skirmish line. Once again a master of historical military fiction has made real the sound and fury of the Civil War.